This weekend we had a full complement of fixtures take place, despite the horrendous weather! In the race for the title, Great Ecc faced a Moorlands team whom they had not played before, whilst in a repeat of the cup semi final, Fulwood traveled up to Wray. Lancaster traveled down to winless Preston City Mission, hoping to keep up their slim hopes of finishing in the top two with a win, whilst Loko traveled to Quernmore looking for another good result against them. 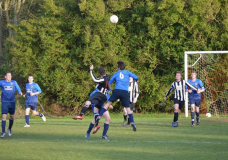 In freezing and windy conditions, the home team were quick to settle and exploit space down the right wing. Jonny Leech slipped past Moorland’s left back to cross from the byline. His cross cut back towards the penalty spot were Bill Gibbons met the ball to smash home the first goal on 5mins. Confident they could extend their lead Great Ecc went in search of a 2nd only to be drawn back against the run of play. Moorlands equalized on 9mins, when a free kick was sent in which keeper Jamie Greenall spilled. The first man to the rebound was Moorlands striker Chris Dent for an easy tap in. Undeterred Eccy continued to venture forward and two minutes later were awarded a free kick 15yrds outside the area down the right channel. On 11mins Capt Simon Greenhalgh saw his effort rebound off the wall back to him. From there, he dribbled past two tackles, past the wall and slipped the ball under the out-coming keeper to give the lead back to Great Ecc. On 26mins, Simon Greenhalgh played a lovely ball through for Jonny Leech to run onto. He turned his full back inside out and scored a cheeky shot from the tightest of angles inside the near post. Great Ecc continued to push but couldn’t get past the efforts of Moorlands keeper, putting in a man of the match performance. Moving into the second half, Great Ecc had many chances to extend their lead, only for their shooting boots to disappear! Dan Parkinson missed two great chances, the first hitting the post from 3 yards out! And the second, he shot wide. Other chances came through a long shot from Adam Moat which the keeper scrambled clear, whilst another effort was cleared off the line, Jack Sharples going close and hitting the post. Just as frustration was setting in for the home side, Moorlands keeper could only parry a shot allowing Toby Parker to tap in from close range in the 83rd minute. Two mins later, Jonny Leech closed a defender down to force a corner. He took it himself, beating the front post for Tom Shields to meet the ball with a thumping header to make it 5-1 on 85 minutes and give more of a gloss to the result. And it should have been more, as late on Bill Gibbons found himself free in the area to head the ball wide! The game finished with a comfortable 5-1 win, although Eccy will be frustrated they did not add more to their goal tally. 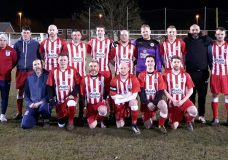 Wray showed real resilience to bounce back from their cup final disappointment to beat Fulwood. Captain Ben Wallbank led from the front with a superb performance as the team dug deep in their second match in 48 hours. Wray, such good starters found themselves ahead minutes into the game, Wallbank stabbing home from a corner to put Wray ahead early on, only for Fulwood to equalize through Elliot Catterson in the 11th minute. However, Wray were determined to continue their charge for the title and the return of Martin Huddleston will be a big help for this. He converted a cross from George Whitaker to adds Wray’s second goal of the game and put them back in the lead in the 18th minute. 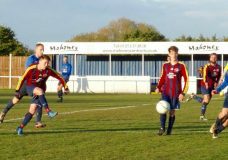 And like Wallbank, Harry Gorst scored his first of the season, finding the top corner from the edge of the box as Wray took charge. However, Wray were not going to have it all their own way as Catterson netted again for the visitors in the 36th minute to bring it back to 3-2 at the break. As the second half began, midfield mastero Stephen Harrison made it 4-2 on 53 minutes and four minutes later, Jack France raced clear to cross for Huddleston to score again. Wray had other chances to make the score more comfortable, but poor finishing, a bobbly pitch or the wind got in the way. 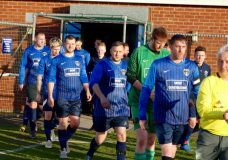 Fulwood continued to battle on and managed a third late on, Catterson netting his hattrick goal, but it proved to be only a consolation as Wray took home the three points. The game kicked off in blizzard like conditions, the wind and snow combining to make it near impossible to see! However, the game was barely minutes old before it was stopped again after a bad clash of heads between Bakri and the Loko full back. He was left the worse of with a bad cut by his eye and was taken off to hospital. All at Quernmore send him their best wishes. However, this 10 minute break did allow for the snow to clear and the sun to come out, which made it seem like it was a nice summers day! Minutes later, the weather took a turn for the worse, the wind making the game quite difficult and it contributed to Loko’s first goal. The ball was crossed into the box, caught by the wind, meaning it evaded Gorst and Harrison before landing at the feet of Hanmer who placed it into the bottom corner. Quernmore were bitterly disappointed, but merely one minute later they were back level. Barki fed the ball into debutant Burrow, who dribbled with it to the edge of the box, past two men and fired it into the bottom corner. It was a great finish. The game was made harder by the wind and the snow, making it rather scrappy, neither team having the better of it. However, it was Loko who were to find the next goal of the game five minutes before half time. The ball was sent forward by centre half Beaumont, which then hung in the air before suddenly dropping, causing Gorst to miss it, but it fell nicely at the feet of Hanmer again who calmly slotted the ball home to make it 2-1. At half time Quernmore made a tactical change, going to a 4-4-2, moving Yates up front with Bakri. Loko were having the better of it in the second half, getting more chances, whilst Quernmore weren’t really playing well at all, not stringing many passes together – a completely different performance than last week! Quernmore were made to pay again as they were slow to close down centre half Beaumont who hit a rasping drive from about 40 yards which flew into the bottom corner. Keeper Rosendale nearly got a hand to it but felt that ultimately he should have done better! This was the sucker punch that Loko needed to ensure that they could ride the match out as winners. There was another change for Quernmore as Barki was injured and so swapped with Rosendale in net. Quernmore tried to find another goal but like most of the game, they didn’t find much of an attacking edge and didn’t really trouble the Loko keeper. Full time and it was 3-1 to Loko. 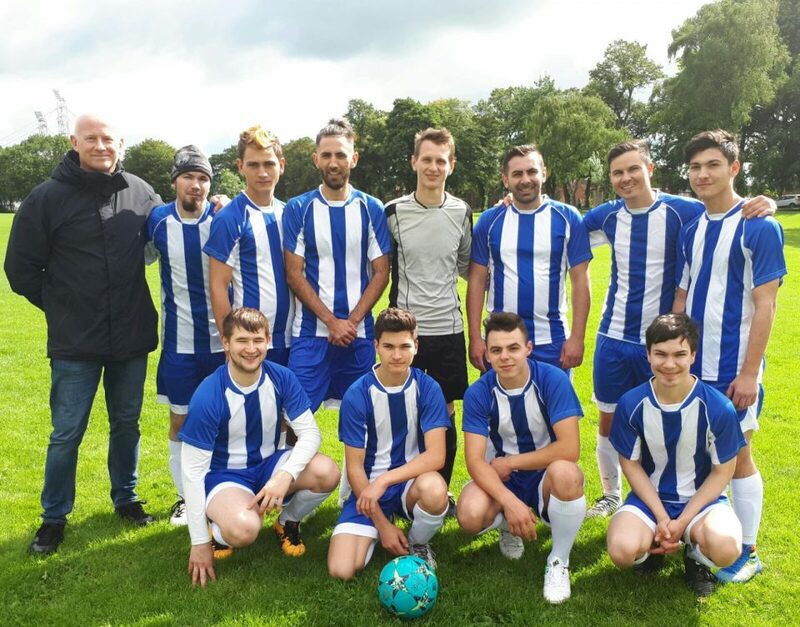 There was delight for Preston City Mission on Saturday as they earned their first win of this season against Lancaster. Preston City Mission opened the scoring through Alex Dodoasca in the 25 minute, however it was to be a short lived lead as Michael White pulled it back level in the 28th minute. In the 36th minute PCM were back in front, again Dodoasca netting for them. Minutes later he was to complete his hat trick as well as he netted in the 39h minute to put PCM 3-1 up. There was to be more delight for Preston before half time as Stoica netted again in the 42nd minute to put them in dreamland and have them 4-1 up at half time. Lancaster were determined to get back into the game and needed to score the first goal in the second half to stand a chance of victory, however it was to be Preston to score again as Stoica scored again, one minute into the second half, 5-1 to Preston! Minutes later, there was to be another goal in this crazy game, Luxton netting for Lancaster to bring it back to 5-2. Was the come back on? The next goal would be crucial! It was to be Preston to get the next goal as well. In the 51st minute, Vintila netted for Preston to make it 6-2. Surely it was all over for Lancaster and Preston were on their way to their first league win of the season? Lancaster were to grab the next goal as White got his second of the game in the 52nd minute – 6-3. There was then a 15 minute wait for the next goal – the longest gap without a goal in this game since the first goal! This was to go to Preston as well as Jianu netted for them in the 67th minute, 7-3. Preston couldn’t have dreamed of a better game so far! Lancaster surely lost the war, but they continued to fight the battles as the added their fourth of the game through Luxton in the 72nd minute. There were to be two more Lancaster goals in the 80th and 84th minute to ensure a tense end to the game as Richardson and Sudell netted for them. Could Lancaster find the 14th goal of this brilliant game? No, they couldn’t! Preston held on and ensured their first league victory of the season!